Featured guest post from Travel Eat Love, a Boston-based contributor. Hello I Heart Brunchers! I am honored and excited to be guest posting on iheartbrunch.com. I love reading the site for tips on brunch in NYC, and I am here today to share my favorite Boston brunch spot with you. If you ever come up, give me a shout! Masa is located in Boston’s foodie filled South End at 439 Tremont St in a warm, funky, Southwest themed space. Their happy hour appetizer tapas can not be beat, and their margaritas are killer. But I am here to talk about brunch. Upon being seated at Masa for weekend brunch, you are presented with a fairly substantial menu with delicious sweet and savory options, all with a Southwestern flair. If it is Saturday, you can opt to choose the Prix Fixe menu which includes a little brunch appetizer, an entree, and coffee or tea. On most occasions, I choose the exact same thing. I start with a signature Bloody Masa which is made of Sauza Blanco Tequila and the chef’s spicy, rich Bloody Mary mix and served with a pickled jalapeno. You can’t go wrong with any of the drinks at Masa. 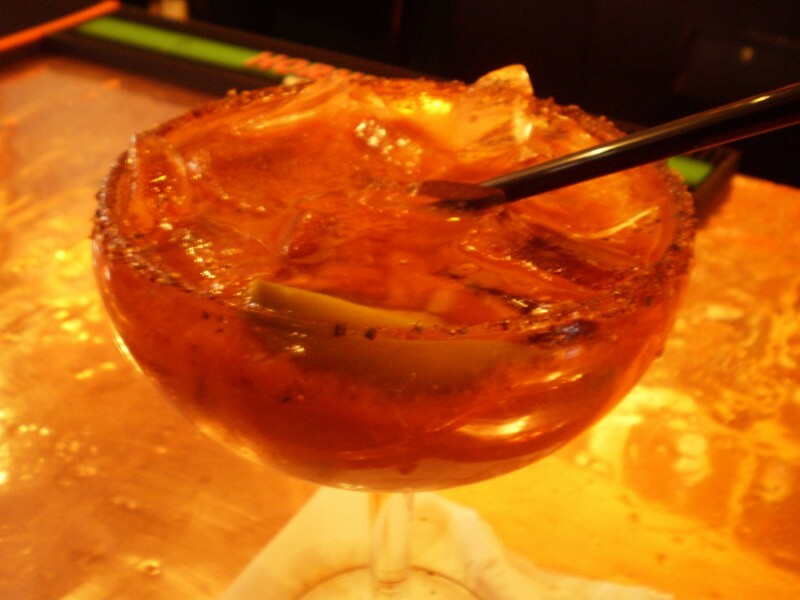 They are always creative and flavorful, and I love that they offer spicy options in addition to their sweet libations. For my meal, I started with a small caramelized plantain empanada with Mexican cinnamon cream cheese. With a rich, sweet dough, and a gooey center, the empanada is the perfect treat to start off brunch on a cold morning. My brunch entree was my all time favorite, Santa Fe Style Eggs Benedict with Southwestern biscuits, avocado, green chili hollandaise and Southwest home fries. Every bite of this dish offers a variety of flavors and textures, warm, spicy, creamy sauce, eggs, and biscuits, cold and tangy pico de gallo, and crisp, salty home friends. Combined with a Bloody Masa, this meal is nothing but satisfying. The brunch time vibe at Masa is bustling but cozy and relaxed. I usually make a reservation and definitely recommend it. Every time I have had brunch at Masa it has been completely packed. Thanks again, I Heart Brunch, for having me as a guest blogger! If you need brunch tips in Boston just let me know at traveleatlove2009@hotmail.com. OMG I am in love with your blog!! So much great information. I too am in love with brunch but my “Peter pancake” is not so it’s always a constant struggle. However if you keep finding all of these AYCD brunch deals he’ll have to come along If it’s alright I would like to link your blog to mine. 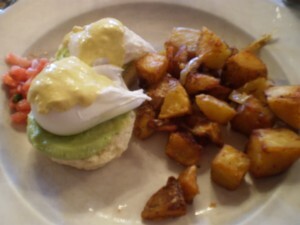 Dude/Dudette- I want those Santa Fe Style Eggs Benedict right now! !